Casino Euro first launched in 2002 and is one of the most popular online casinos. In ten years, more than 750,000 players have registered with Casino Euro. Casino Euro offers a broad assortment of games, with multiple progressive jackpot games. Casino Euro is licensed by the Lotteries and Gaming Authority (LGA) in Malta, permitting it to offer online casino games. 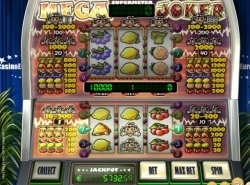 As a result the casino can offer games such as roulette, blackjack, slots and poker within the EU. Casino Euro’s website is especially user friendly. Because the casino is powered by Flash technology, you can play games on the website itself. You don’t need to install any software. Other popular promotions include, for instance, free credit to try out new slots and free tournaments where significant amounts can be won. Casino Euro also knows how to make a public holiday truly festive with special promotions. Casino Euro’s main attraction is its live casino. Play the most popular table games against real flesh-and-blood dealers. The beauty of the dealers alone is a sound reason for you to experience this. Casino Euro also has a fantastic mobile casino. Play your favourite games on your cell phone or tablet computer anywhere you want. All you need is an internet connection. The assortment of games consists of, among other things, slots, roulette, blackjack and video poker, but is regularly updated. You can try the games for free, or play for money. Additionally, you can use your existing account. Telephone support Calling Casino Euro’s support number is free of charge. Live chat Ask questions directly through live chat. E-mail Queries are answered within 30 minutes. When withdrawing money, the minimum amount is €20 per transaction. Whenever a payment is requested, the money will be available in your account within one day.